UK engineers have completed the build of the novel Quantum satellite. The telecommunications platform will be the first fully software-defined spacecraft. Traditionally, large satellites are configured on the ground for specific tasks that cannot be changed after launch, even if market demands evolve. Quantum’s coverage, bandwidth, power and frequency can all be altered in orbit. 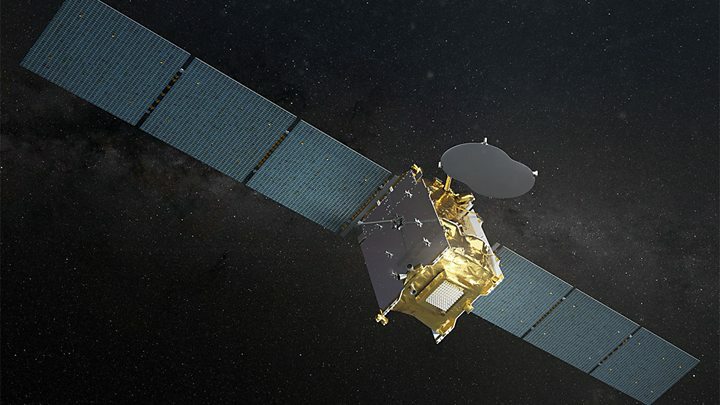 The big Paris-based telecoms operator Eutelsat has procured the 3.5-tonne spacecraft in a R&D partnership with the European Space Agency (Esa), with manufacturer Airbus acting as the prime contractor. Yohann Leroy, the Deputy CEO and CTO at Eutelsat, said he believed Quantum to be a game-changer for his industry. “It will bring unprecedented flexibility to our customers, allowing for in-orbit payload re-configuration and taking customisation to a new level, while also opening the way to a paradigm shift in the manufacture of telecommunications satellites,” he told reporters. Airbus used its Portsmouth facility to develop the adaptable telecoms payload, and its subsidiary Surrey Satellite Technology Ltd in Guildford to make the spacecraft bus, or chassis. The two halves will now be integrated at the Airbus test facility in Toulouse before being shipped to French Guiana and a ride to orbit on an Ariane 5 rocket at the end of the year. SSTL held a special event on Wednesday to mark the handover of its element of the project. Quantum has been a step-change for a company that is perhaps best known for making small low-Earth-orbiting imaging satellites and Galileo sat-nav payloads. Quantum is significant because it heralds a new era in multi-mission satellites. The telecoms spacecraft that sit 36,000km above the equator are used to bounce TV, phone calls, broadband and other data services around the planet. Today, these satellites are set up to deliver very specific products to defined markets. This might mean, for example, transmitting only on certain radio frequencies with shaped antennas to carve out the necessary ground “footprint”. But telecoms markets don’t stand still, and being able to totally reconfigure an in-orbit platform would allow an operator to adapt to any shifts in the business landscape – without the need to build and launch another bespoke platform. The operator would simply reprogram the existing satellite. Those antennas could electronically “change their shape”. David Phillips, Airbus’s Head of UK Programmes, said the European and UK space agencies had been quite prescient in pushing for the Quantum development. “The components and technologies that enable software-defined satellites will become more and more the future of our industry,” he commented. Why is this important to the UK? British industry has tried to position itself as the go-to supplier of telecommunications satellites. UK technology has made a significant contribution to something like a quarter of all the world’s large platforms in this sector. Eutelsat, one of the “Big Three” global satcom operators, counts 23 of its 38 currently operational spacecraft as having British input. Six of their next seven satellites will continue this trend. And to make sure UK industry remains competitive, the home government has pushed considerable investment through the R&D programmes of Esa’s telecommunications directorate. Quantum has emerged from a project initiated in 2014 and originally codenamed “AnySAT”. The UK put up €72m (£65m) of funding, with other Esa member states contributing €8m. This dominance guaranteed the major part of the development work would come to the UK. The market for big telecoms satellites is presently going through a lull, but products like Quantum will position Britain to do well when orders pick up again, believes Catherine Mealing-Jones, the Director of Growth at the UK Space Agency. “Having assets in space that are flexible and can meet changing needs is absolutely essential, and that has underpinned the UK Space Agency’s investment strategy in telecoms over the last few years,” she said.